Over the years, throughout his travels all over the globe, one thing was a constant in Marvin L. Warner's world. Birmingham, where Warner was born and raised, would always be home. And to the man who said you couldn't go home again, well, he simply didn't know Marvin L. Warner's devotion and affection for the city. And that affection manifest itself once again when Warner brought his own USFL franchise to his hometown. As a founding member of the league, Warner lends an established and distinguished record in both public service and the private sector. A graduate of the University of Alabama, Warner entered the U.S. Army upon graduation, serving in the Western Pacific until 1946 and leaving the service with the rank of major. While stationed in Washington, D.C., he earned a master's degree in law from George Washington University. When his military obligations were complete, Warner returned to Birmingham and entered the real estate and insurance fields. With a housing need for returning veterans, he began building small, then larger projects under the National Housing Act. In 1951, Warner moved his operations base to Cincinnati, yet he maintained his ties to his native state while adopting new ones in his adopted environs. He became chairman of the Ohio Board of Regents, a member of the Democratic National Committee, and a Grand Commodore of the Ohio Association of Commodores. This is an honorary service organized, formed and appointed by the Governor of Ohio. Within his home state, Warner has continued to be active at the university as a member of the President's Cabinet and as a member of the Board of Visitors of the School of Commerce. 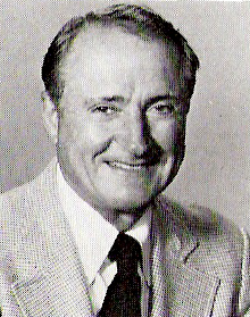 In 1978, he was the keynote speaker at the University of Alabama Commerce Hall of Fame. In 1968, Warner served as a member of the U.S. delegation to the 23rd General Assembly of the United Nations. In 1977, President Jimmy Carter named him as this nation's Ambassador to Switzerland. He served in that capacity until 1979. Ambassador Warner's purchase of the Stallions franchise marks his fourth venture into professional sports. At one time, he has owned 10 percent of the baseball New York Yankees and also was a 48 percent holder of the NFL Tampa Bay Buccaneers. Warner also is one of America's best known and most successful thoroughbred race horse owners and breeders. He serves currently as chairman and chief executive officer of ComBanks Corporation and Great American Banks, Inc., of Orlando and Miami, FL, respectively, and is principal owner of Warner National Corporation of Cincinnati, a financial holding company. Warner was one of the more staunch supporters of the USFL concept, but by the third year of the Stallions' existence had hit a series of legal and financial problems that caused him to sell the Stallions - the fact that they played in 1985 is a story in itself. Home State Savings Bank, which he had founded in 1973, went bankrupt in 1985 thanks to fraud. Warner was immediately implicated, and ultimately convicted, being sentenced to 6 1/2 years in prison. Fighting the conviction delayed his term, but exhausting his appeals he was finally imprisioned at the Madison Correctional Center in Lebanon, Ohio in April 1991. Serving 2 1/2 years he was released, retiring to a farm in Florida - one of the few things he was permitted to keep, as creditors otherwise picked him clean. Warner died at the age of 82 on April 8, 2002, and what remaining assets he had were then liquidated to satisfy creditors. NOTE: Most of the above bio, with the exception of the supplemental material, is reprinted from the 1983 USFL Media Guide.